Protecting your VISA® debit card from fraud requires 24/7 – 365 days a year monitoring. Our fraud detection programs monitor your card transactions for any suspicious activity. Get Consumer Alerts for large purchases, activity notifications, low balance warnings and more. You choose the alerts you want to receive and how you want to receive them. Whether by text message or email, Consumer Alerts offer a convenient way for you to manage your money and help protect you from fraud by putting you in control of your account information. *Message and Data Rates may apply. Please review the Terms and Conditions. You can discontinue this service at any time by unsubscribing on the website or texting the work ‘STOP’ to 26499. The number of messages received will be based on your own card usage. Fraud Risk Identification Service reduces fraud by identifying customers’ general spending habits and looking for transactions that appear out of the ordinary. With FRIS, trained analysts watch for suspicious transaction activity on your behalf, 24/7 365 days a year. You will be contacted directly by an experienced fraud analyst to verify the authenticity of your debit card transactions. If you ever receive a call from “FRIS”, know that our people are doing their job and preventing potential misuse of your card. You will NEVER be asked to provide your debit card number, Social Security number, or PIN number. If you ever encounter this situation, please contact us immediately at 724-354-2111. Keep us up-to-date with your current contact information including mobile and home phone numbers. Contact us at 724-354-2111 or in writing at 143 N. Main Street, Elderton, PA 15736. Traveling and planning to use your VISAâ debit card? Be sure to contact us at 724-354-2111 to ensure your card is available for use during travel. Notify us immediately if your VISA® debit card is lost or stolen. During regular business hours please call us at 724-354-2111 or after-hours contact STAR direct at their toll-free number 1-800-523-4175. Keeping you and your personal information secure is a priority of Elderton State Bank. We continuously strive to ensure that your financial information is safe. Review the topics below to see what Elderton State Bank is doing to help protect you and for tips on how to protect yourself when using our Online Banking and BillPay service. Elderton State Bank will never send you an email requesting your personal information, account information, Online Banking password, or ATM PIN. The only time we may ask you these types of questions is when you contact us in person or by phone requesting a banking transaction (for example, new account opening, loan application, transaction between two accounts, etc.) or when logging into Online Banking. This information is matched against our customer record for verification. If you ever encounter this situation outside of these circumstances, or in an email that appears to be from Elderton State Bank, please contact us immediately at (724) 354-2111, Monday – Friday, 8:30am to 4:00pm and Saturday, 8:30am to 12noon. Online Security is our Priority! View these brochures for important facts about your Account Authentication and Online Banking. View our Identity Theft Brochure by using the Adobe Reader. 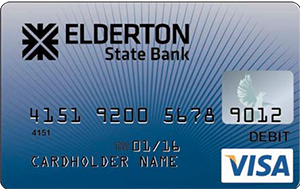 Elderton State Bank is confident of our system’s ability to protect all transactions; however, this system is for the use of authorized users only. This is a private computing system; its use is restricted to authorized individuals. Actual or attempted unauthorized use of this computer system will result in criminal and/or civil prosecution. We reserve the right to view, monitor and record activity on the system without notice or permission. Any information obtained by monitoring, reviewing or recording is subject to review by law enforcement organizations in connection with the investigation or prosecution of possible criminal activity on the system. If you are not an authorized user of this system or do not consent to continued monitoring, please exit the system at this time. The basics on how to protect your personal information and your money from FDIC Consumer News. We recommend reading this article in PDF format on the most common bank scams and how to protect yourself. There are numerous scams presented daily to consumers so you must always exercise caution when it comes to your personal and ﬁnancial information. The following tips may help prevent you from becoming a fraud victim. Be wary of unsolicited offers that require you to act fast. If you suspect you are the victim of a scam , please contact us immediately. Keeping you and your personal information secure is a priority of Elderton State Bank. Download this notice in PDF format. Traveling Out of the State or Country? If you are traveling out of the state or out of the country, please let us know. To help protect our customers from fraud, your debit card may be blocked for use in specific states and/or countries. Call us at 724‐354‐2111.